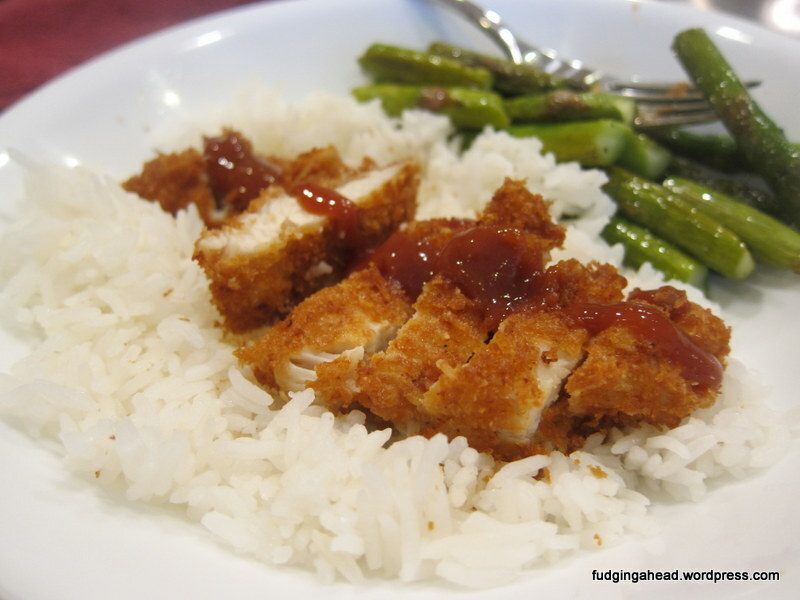 One of the reasons I really wanted to make the Chicken Katsu recipe was to make this recipe. 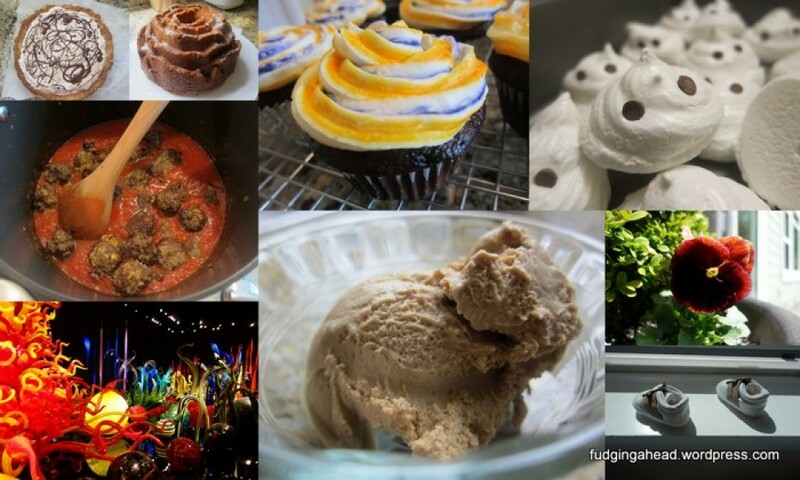 I like the idea of leftovers redone. What’s also awesome is this recipe comes together in about 10-15 minutes, including the time to pull everything out and chop the onions. Very simple and fast, but still something “new” for your leftovers. This is something you normally serve with rice, but on the day I took these pictures, we had leftover tater tots from earlier that I served it with for K. Even with cooking the chicken in broth, the egg makes it less soupy and more omelette-like. In a small-medium saucepan, large enough to fit your cutlet, add the chicken broth, soy sauce, rice vinegar, sugar, and mirin. Bring to a simmer over medium heat. 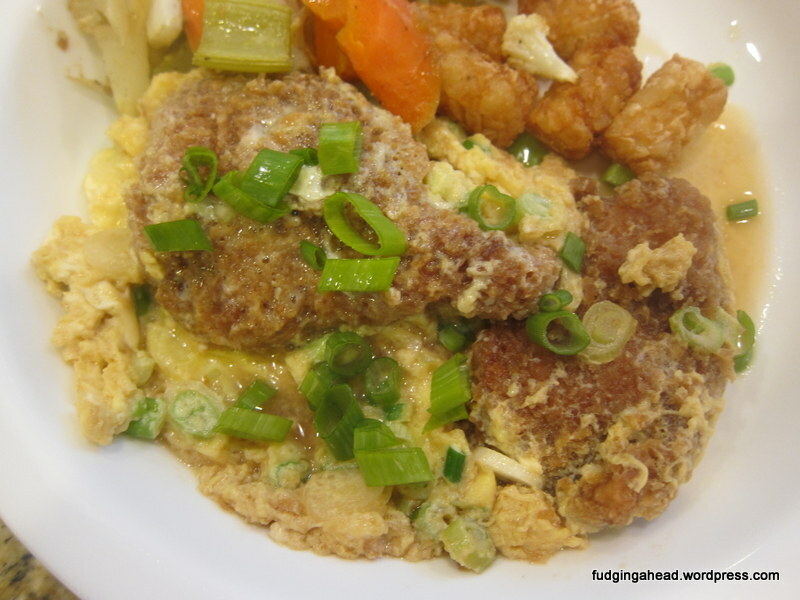 Meanwhile, beat together the eggs and green onions (not the green parts) in a small bowl. 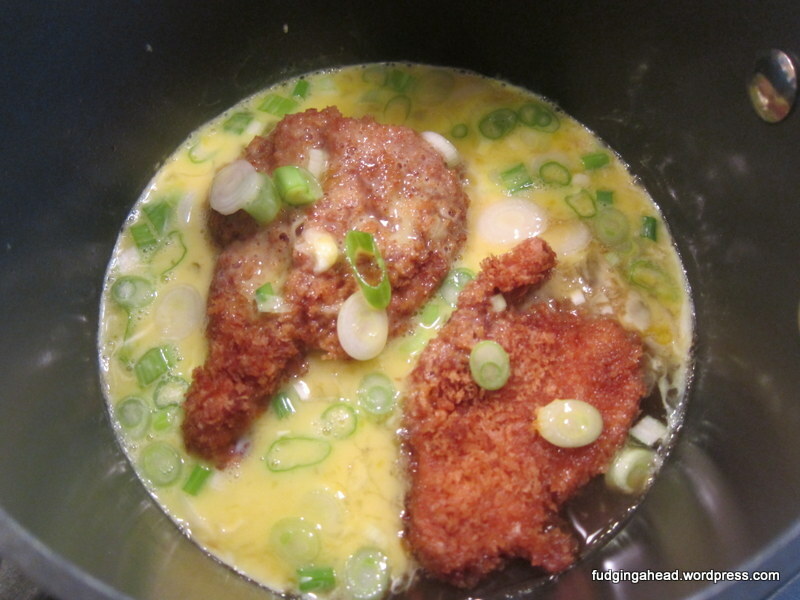 Add the chicken cutlet to the saucepan and let it simmer for 1 minute. Pour the egg mixture around the chicken, into the broth. It is okay if some of the mixture gets onto the chicken as well. Cover and cook until the eggs are as set as you would like (1-3 minutes). Pour carefully onto a bowl of rice, sprinkle with the green parts of the chopped green onion and serve. In a small-medium saucepan, large enough to fit your cutlet, add the chicken broth, soy sauce, rice vinegar, sugar, and mirin. Bring to a simmer over medium heat. 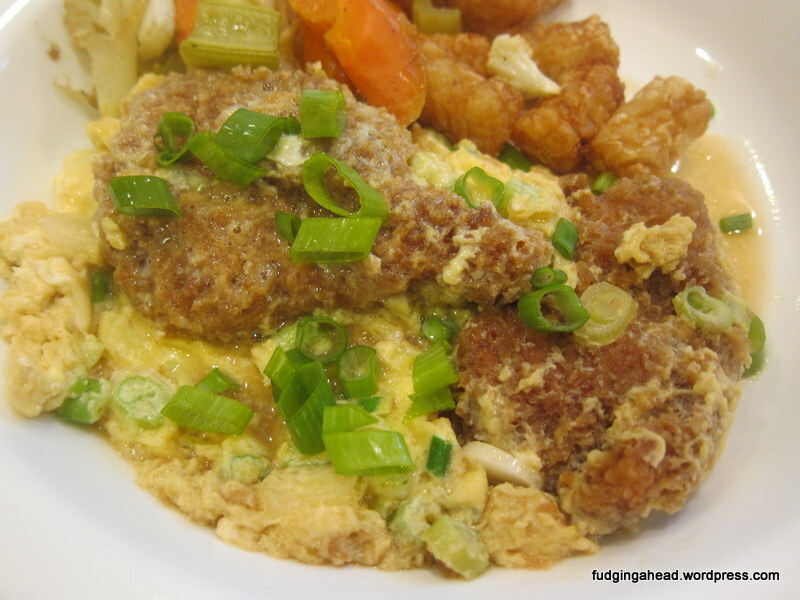 Meanwhile, beat together the eggs and green onions (not the green parts) in a small bowl. Add the chicken cutlet to the saucepan and let it simmer for 1 minute. Pour the egg mixture around the chicken, into the broth. It is okay if some of the mixture gets onto the chicken as well. Cover and cook until the eggs are as set as you would like (1-3 minutes). Pour carefully onto a bowl of rice, sprinkle with the green parts of the chopped green onion and serve.